Esencia means essence in Spanish. Esencia Todos Santos is the first private gated residential community in the Todos Santos area. It is located in a spectacular site between the town center and the ocean, a few hundred yards from the beach. This five hectare (approximately 14 acres) site is one of the few well-located parcels for up-scale development in the Todos Santos area. Homes start at $249,000. The topography of this unique location in Todos Santos has higher ground with views of the Pacific and the mountains surrounding a lower garden area, allowing for a more esthetically pleasing placement of detached villas. 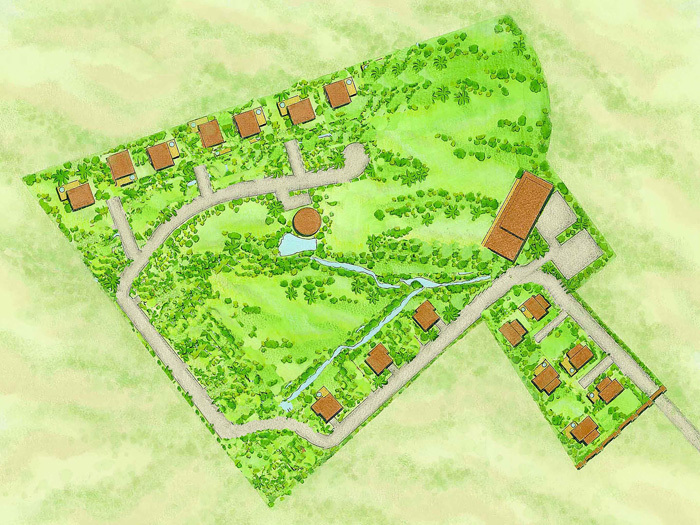 The master plan maximizes the green/open space as well as hiding, to the extent possible, access roads to the individual units. The master plan has been designed to enrich the special characteristics of the site through thoughtful, sensitive and sustainable planning and design. Our intent is to be as eco-friendly as possible through conservation of the natural environment, utilizing sustainable building materials and techniques, as well as incorporating passive design and water conservation techniques.